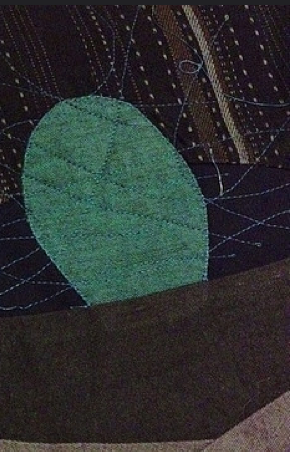 Stopping by Woods on a Snowy Evening, a Four-in-art Quilt | OccasionalPiece--Quilt! Oh, Elizabeth, this is so perfect!!!! My late ex-mother-in-law, Frances, loved this poem above all others and she quoted it often. Since she became my MIL when I was just 19, much of my truly formative years were influenced by “…promised to keep… miles to go before I sleep”. I think it may have been her motherly way of keeping me on the straight and narrow! Your use of log cabin pattern combined with curves and trees done in free motion is just wonderful – love it all! This is brilliant. I love your interpretation and look forward to this year’s journey with you. The piece itself is lovely. Lovely. 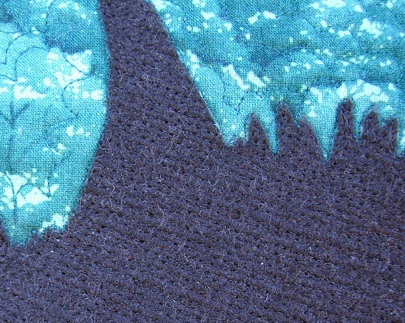 When I saw your wintery fabric pull, I wondered where you where going with the idea. This is great. (not the least because we have a blizzard warning today!) Depression has been something that I have had to deal with in my life – not my personal experience, but those around me. I think that is the brilliance of poetry and books, they speak to you where you are. So maybe that’s not what Frost was thinking of, but it can still be applied to our own lives. 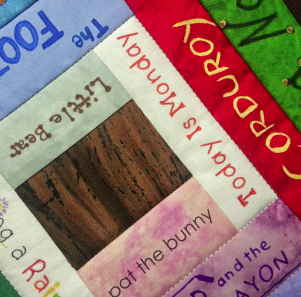 Looking forward to more seasonal and poetry quilts! I always saw this poem as being about commitment and honor, one must keep those promises before one can rest and enjoy the woods, but then I’m not a teacher. 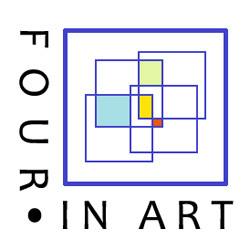 I love this interpretation of it and I think this is my favourite so far of all your 4 in Art quilts. This is wonderful Elizabeth. The tiny houses the words ( I love words) everything. What a great idea for a quilt challenge! I’m a retired college prof and my field was language analysis so, for me, it’s all about the words. 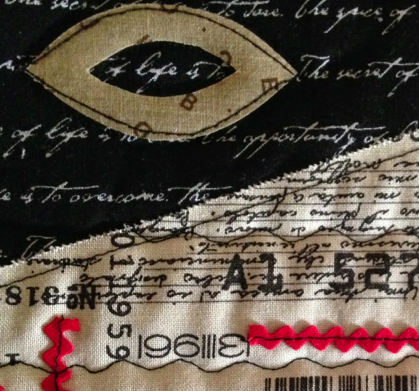 I love the way you used the poem as inspiration and interpreted it in fabric. I also love the lesson in lit crit you provided us! Your interpretation is as beautiful as the poem! 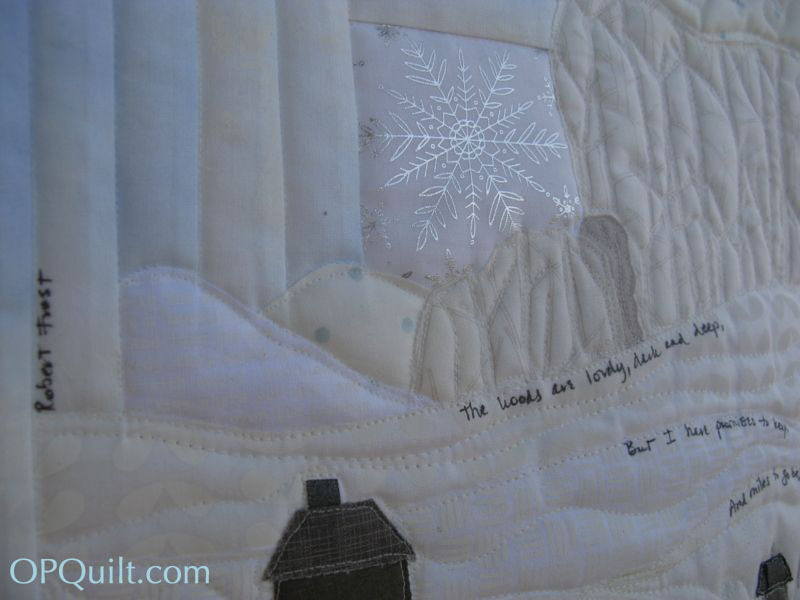 I love the frosty fabrics you chose, your trees and the way you have captured the pillowy snow with your quilting, but I think that the way you have captured and reflected the lyrical rhythm of the words by incorporating it into the rolling landscape is especially clever. Thank you, Elizabeth. We don’t usually have enough poetry in our daily lives. Reading a psalm every day does help with that some, but we also need other voices working on other ideas. It’s truly a gift how your engagement with fabric will bring us poetry this year. Lovely…and such an interesting read. Great job, Elizabeth. I’m off to see the other entries. Well done. 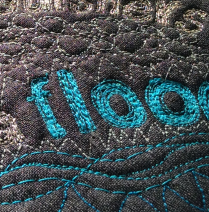 The quilted interpretation of the poem is lovely. The fabric choices spectacular. I think the use of the log cabin contrasting with the curves is great. The rhythm of the poem in the curves and the freedom of meandering exploration in those woods is shown opposed to the structure of the straight lines of the logs–the things we have to do in life. I remember years ago cross-country skiing with a group of friends late at night under a full moon and the beauty of the snowy woods in which we traveled. I never interpreted the poem in the way you have described. Your work has me thinking of this description. I was surprised ( as you were) to see that we both used the log cabin in our pieces. 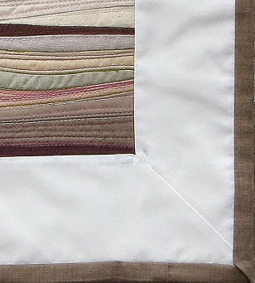 I think the little sneak peeks of the other quilts on your blog was very thoughtful. I love the subtle and cool log cabin corner! Very clever! 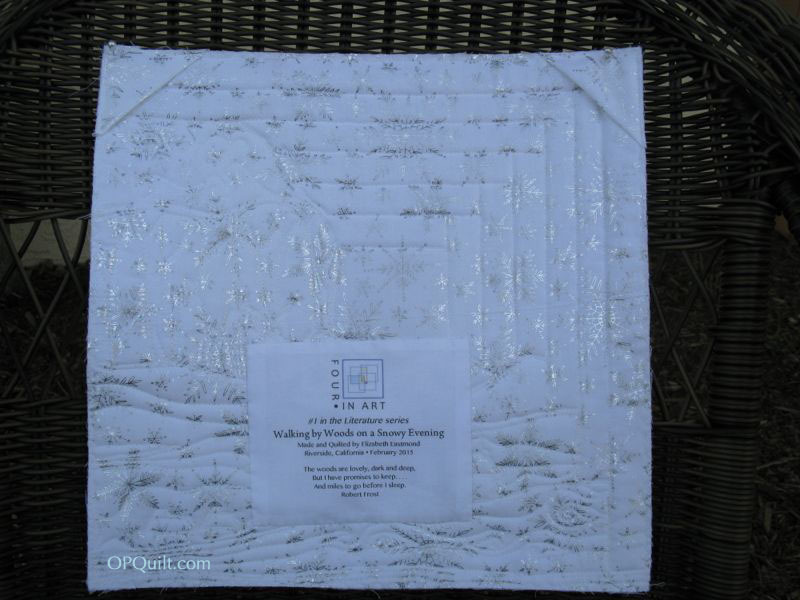 ANd your quilting adds that layer to the interpretation that I am still struggling with! Great job as usual! First of all I have to say it was wonderful to see your quilt in person yesterday. You have such the advantage of being able to study Robert Frost at work!!! 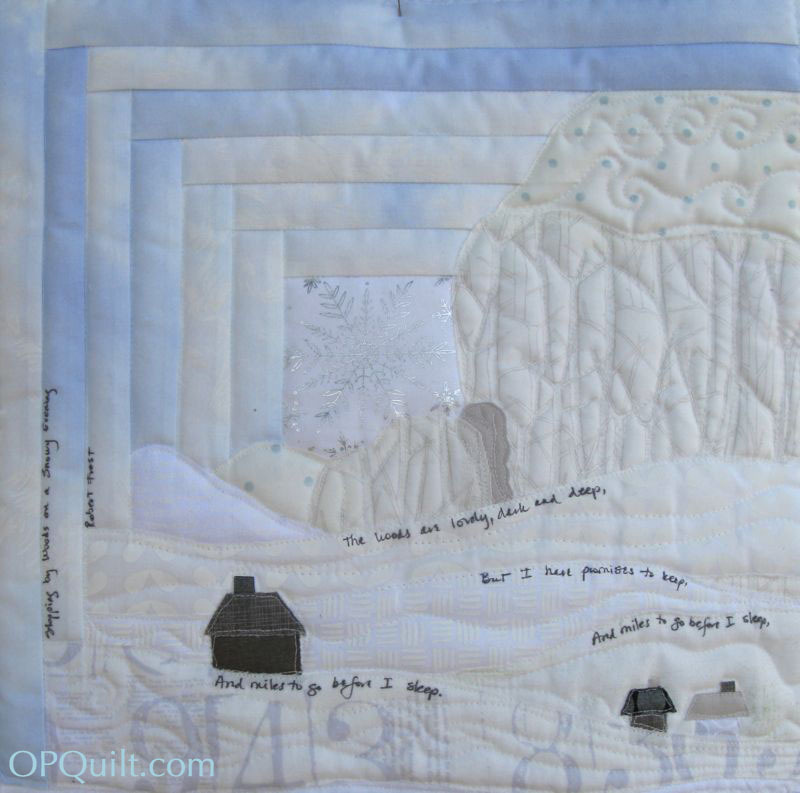 It’s amazing how viewing your quilt and then reading the poem brings so much depth and understanding to the wintry scene you have depicted here. I would be happy to trudge through the snowy trails and snuggle by a warm fireplace in any of the cottages pictured here. I like how you have woven, in a sense, the words of the poem into the wavy hillside and snow banks. It’s also interesting to explore the topic of depression in such a bright white quilt too. 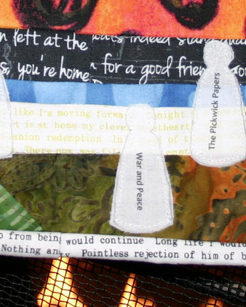 I am looking forward to being able to see your completed 4 poetry quilts. I remember hearing Robert Frost read a poem at JFK’s inaugural. What a treat to remember him, understand his poem better, and appreciate your art. This is lovely! I feel like it really captures the feel of the poem. Thanks for sharing the whole thing with us- it’s been a while since I’ve read much poetry and I’m thinking I should go back to some! You’re off to a wonderful start for the year of Elizabeth. 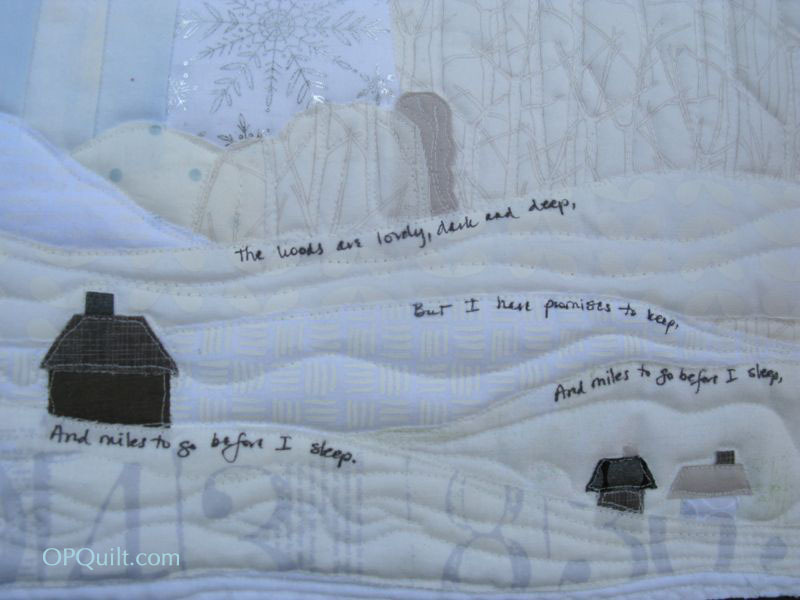 I love the idea of poetry and this first quilt is so perfect. Very special connection as well which makes it all the more meaningful. I’ve always liked Robert Frost from my long ago school days. Well done. Look forward to the rest in your series. Your posts are on a higher level than ours, Elizabeth. There is so much to absorb in them. Thank you. 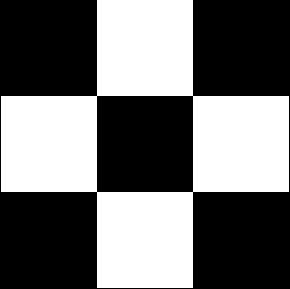 Pingback: [in Just-], a Four-in-Art Quilt | OccasionalPiece--Quilt!